Sian and Clare are going clothes shopping! Join them to find out what they buy - and to learn some useful shopping vocabulary. Sian and Clare are going clothes shopping! 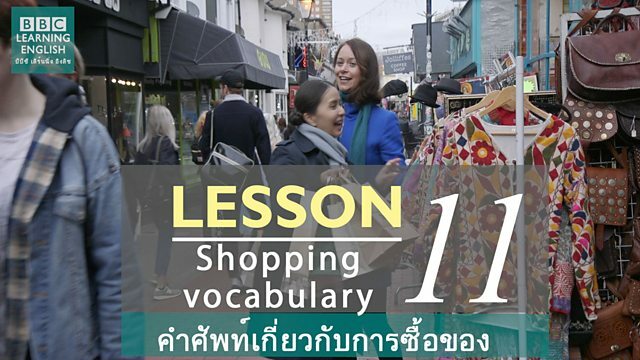 Join them to find out what they buy - and to learn useful shopping vocabulary. I'm going to clothes shops to buy things. I'm looking at clothes in shop windows without intending to buy them. I'm going for a look around the shops. I'm going to look in shops, but I may not buy anything. Don't say: try on it. Try this quiz to find out how well you can talk about shopping! How do you say 'ใส่' in English? It's getting cold - I'm going to ______ . One of these sentences has an extra word! Are jeans plural or singular? These jeans are nice. Can I ______ , please? How do you say 'ห้องลองเสื้อ' in English? Where are the ______ ? Join us for our next episode of English on the street 2 to learn more about English pronunciation, grammar and vocabulary.